The double entry bookkeeping principle is profoundly important in the world of accounting. It is essential that students of accounting gain an understanding, from the outset, of this principle that is more than 500 years old. Essentially, the principle is that for every financial transaction there are two effects  one debit effect and one credit effect. This best way to explain the double entry bookkeeping principle is to give an example of transactions from the books of the imaginary organisation called Lots of Fun Pty Ltd.
Lots of Fun Pty Ltd acquires an ASSET worth $5,000 (the car). This is the debit affect. At the same time it also incurs a LIABILITY to the bank of $5,000 (the bank loan). This is the credit effect. 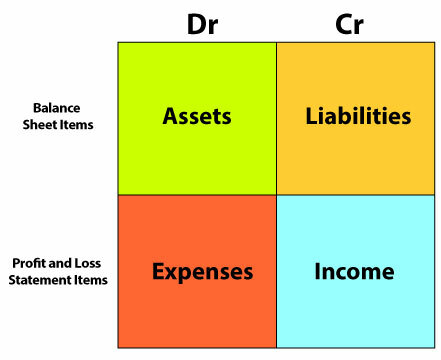 Refer to the figure 1: "nature of accounts" below. As a result of the transaction the bank account of Lots of Fun Pty Ltd (and ASSET account) increases by $30. This is the debit affect. Lots of Fun Pty Ltd has increased INCOME (which we might call "Court Hire Fees"). This is the credit effect. Lots of Fun Pty Ltd has increased wage EXPENSES by $500. This is the debit affect. As a result cash ASSET of Lots of Fun Pty Ltd decreases by $500. This is the credit effect. A LIABILITYaccount called "Accounts Payable" decreases by $1000 ( as the debt is now paid off). This is the debit affect. The Bank Account (an ASSET) also decreases by $1000. This is the credit effect. Your job (as an accountant or a bookkeeper) is to correctly record these transactions in the financial ledgers of the organisation. You have to record one debit affect and one credit affect for each transaction. Of course, these days modern account software does the job for you but understanding the principle is important in understanding how accounting software works. Now let's introduce to you a diagram (figure 1) that you must indelibly print into your brain! Your ability to remember this diagram might be the key to understanding the double entry bookkeeping principle and your success in book-keeping. The purpose of the diagram is to tell you when you should be debiting and when you should be crediting when you are identifying the two effects that result from every transaction. In the examples given above, you will note the words in bold - Asset, Liability, Expense, Income. These are the four different types of account. 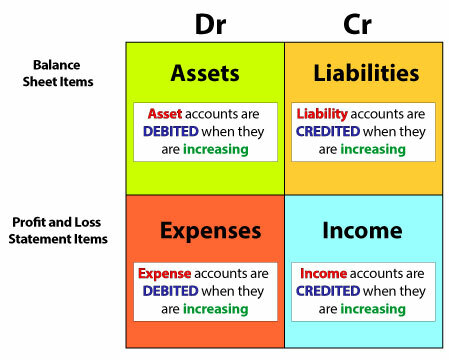 In Figure 1, at the top, are the two abbreviations "Dr" and "Cr" which stand for "Debit" and "Credit" respectively. You should also note that Assets and Expenses appear on the Debit side while Liabilities and Income appear on the Credit side. Here is the first explanation! You should note in Figure 2, that each effect is true only when the account is increasing. Therefore when an EXPENSE is increased as a result of a transaction, it will be debited. When the LIABILITY is increased as a result of a transaction, it will be credited. 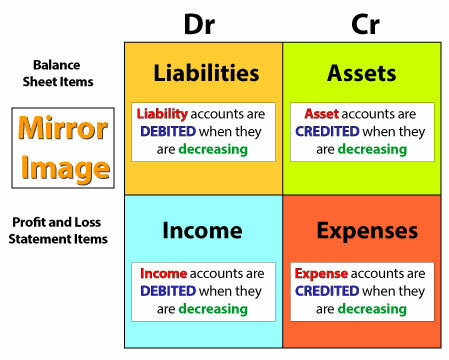 However, if the effect of the transaction is to decrease the an account, then the mirror image of Figure 2 will appear as in Figure 3. Figure 3: Determining whether to debit or credit when an account is decreasing. In Example 1 given above, the acquisition of the car (the asset) gives rise to an entry on the debit side (of the asset account Motor Vehicles). This is because the assets of Lots of Fun Pty Ltd are increasing. Simultaneously, the liabilities of Lots of Fun Pty Ltd are increasing as well, and so there will be a credit entry to the Bank Loan account. Motor Vehicles (an Asset Account) is debited because it is increasing (you have more asset that you did before). Bank Loan ( a Liability Account) is credited because it is also increasing (you have more liability than you did before). A bank loan is a liability because it is a debt you owe the bank. In Example 2 given above, the income (Court Hire Fees) of Lots of Fun Pty Ltd is increasing and as a result its Bank Account is also increasing. Lots of Fun Pty Ltd received $30 cash from a customer for the hire of a tennis court. Court Hire Fees (an Income Account) is credited because it is increasing. In Example 3 given above, Lots of Fun Pty Ltd has increased expenses (Wages) of $500 and simultaneously decreased cash assets (Bank) of $500. Wages (an Expense Account) is debited because it is increasing. In Example 4 given above, the liabilities (Creditors) of Lots of Fun Pty Ltd decrease by $1000 (the debt is now paid off) but its Bank Account also decreases by $1000. Creditors (a Liability Account) is debited because it is decreasing. Bank (an Asset Account) is credited because it is decreasing. Determine which two accounts will be affected by the transaction? For each of the two accounts you identify in Step 1, you must determine whether it is a Asset, Liability, Expense or Income. For each of the two accounts you identify in Step 1, you must determine whether the account is increasing or decreasing. By following these three steps, and using the diagram given above, you will be able to determine whether each account is debited or credited. The double entry bookkeeping principle is really quite simple, but you must be sure to follow the above steps.